Whether you’re only just beginning your marketer master path or you already see yourself as the ultimate money game super pro, it’s always important to follow the market’s cutting-edge trends to stay on top! How the heck are you supposed to do that? By spying competitors’ ads, that’s how! Indeed, it’s crucial that you check which promo materials (banners, landing pages) other affiliate marketers are currently using. By analyzing how they do what they do, you’ll be able to create a strategy and earn big! Even so, don’t go crazy, looking for spying tools like an addiction! Because there’s a whole bunch of them and we wanna make sure you select THE best one to do your thing! Today, we’ll create an article bearing both AdPlexity (30% Lifetime Discount Coupon) and WhatRunsWhere in mind. These are the best tools to spy on your competitors’ ads so you can follow and understand the techniques you can use to explore your spying skills to the max! AdPlexity is the leading ad spy tool and our favorite tool by far. 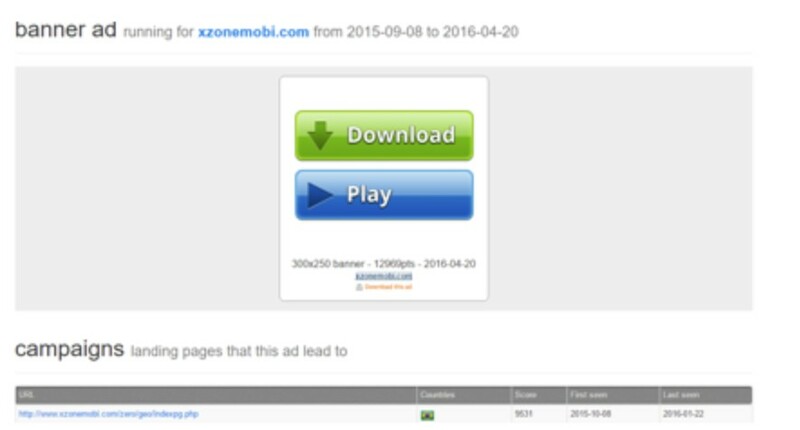 By entering the platform, you can monitor and download promo materials (banners and landing pages) from the most popular ad networks (more than 100) and ad exchanges across 75 countries and 120 carriers. AdPlexity eCommerce – See competitors most profitable shops, popular apps and much more. AdPlexity provides several approaches, according to the different goals. Now let’s try to imagine the questions you’re asking yourself! That’s how we’ll answer them and make sure you know everything you need to know before making your move! Question #1 – Which offers are affiliate marketers running on a certain segment (country + operator + OS) and what promo materials are they using? For you to be able to check this, filter by Country, Operator and Device type. This is how you can see all the campaigns that are currently running on this segment. This filter will also let you get the list of banners and landing pages. Moreover, you can filter Ad Type for Mobile Web to see only banners, or for popunder, to see only landing pages. Even when you filter by Mobile Web, you can click any banner and check its landing page. From what you’ll find, some campaigns have a direct link to the offer and some are linked to a pre-landing page from where the user is already going to the offer. AdPlexity’s Tutorial suggests that, in order to find campaigns which use a pre-landing page, you should select “Search in outgoing URLs”. Even with this selection, you’ll still find many campaigns with the direct link to an offer. Another suggestion from AdPlexity: uncheck “None” at the tracking tool filter, since 99% of all affiliate marketing campaigns use a tracking tool. This will exclude brand marketing and other non-relevant campaign types. Question #2 – How do I know which promo materials were used to promote a specific offer type? Let’s say you’re interested in an iPhone sweepstake offer. What you’ve gotta do is search by keyword on the landing page for “iPhone”. This is how you’ll get all the campaigns which include the word “iPhone” on their landing pages. No matter what you’re searching for, it’s always better to specify the segment (country + operator + OS), otherwise you’ll have too many results in random languages. On the other hand, you can sort global results by “Received Most Traffic” and see which are the biggest markets in specific segments for this kind of offer. You can also see which promo material ran for a longer period since it may mean that it actually performs well. Question #3 – How did affiliates run a particular offer? We know a great offer to promote, but we’re not sure how to actually promote it. Check how others are doing it! First of all, we need the landing page URL of the offer. If the offer is available for Wi-Fi targeting, you can open the affiliate link of the offer through a VPN with an appropriate country and get to the offer’s landing page. Then, you search for this URL by advertiser and BAM, you’ll see all the campaigns promoting this offer and their promo materials! Question #4 – What and how are affiliates running on a specific website? Imagine you know that some website works very well but you’re just not sure about how to promote there. Open the tab “By Publisher” and insert the website you wanna check. Then you can specify the segment you’re interested in (country + operator + OS). Just to summarize, AdPlexity is the greatest spy tool of them all! It makes all others pale in comparison, especially because you can find and download many pre-landing pages on AdPlexity. That’s huge, since it’s a cool opportunity that’ll allow you to understand the whole flow used by other media buyers to sign up their users and get slippery sweet profits! Important note: You should check our in-depth AdPlexity Review Guide (Video Tutorial Included) in order to learn all the hidden tricks. Now it’s time to learn how to explore another awesome spy tool: WhatRunsWhere! 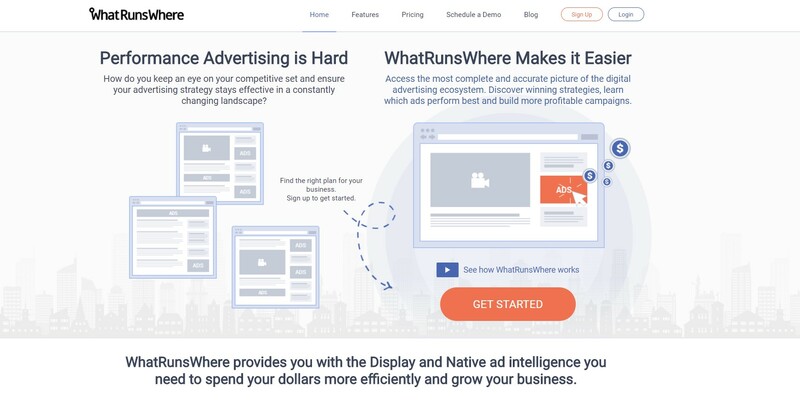 WhatRunsWhere is a marketing spy tool that allows you to find: a) where your competitors are advertising; b) what kind of ads they’re using; c) which advertisers and ads are running on a particular domain, by keywords. Plus: WhatRunsWhere collects data that’s displayed in 22 countries. You can select among display version, mobile, or full (display+mobile). WhatRunsWhere has international coverage for over 150 display networks and 140 mobile ad networks. It also collects banner, text and native advertisements. The cool thing about WhatRunsWhere is the fact that it allows you to get a trial version for 1USD for 3 days, which you should use wisely. WARNING: in case you forget to cancel the subscription before the expiration date, the money for the full version will be automatically deducted from your account! WhatRunsWhere offers you the possibility to search by advertiser, publisher, keyword or network. Using the enterprise version, you can explore the advanced opportunity to search by category and network. These features will help you find inspiration and launch the new geos while being fully prepared! This feature allows you to find where the advertiser is running his ads. Imagine you have decided to advertise Uber. All you’ve gotta do is insert the domain’s name in the search by advertiser field. You can then see demographics, sources of traffic and all ads (text, banner, native) for it, as well as info about the publishers. Important: we advise you to sort the creatives by Adstrength, as it’ll show you the best ads first! If you wanna put your ads on the specific site, this section is for you. For the specific domain, you’ll get info about sources of traffic, type of ads, and a list of advertisers. You can check all the ads that were placed on it, for how long it was running, and other details. Moreover, you can pick the most popular domains, to find out which offers your competitors are promoting. This section is great for you to research a specific niche. For instance, you can check the info for the keyword “beauty” on the following image. You can also select the format that interests you the most. Searching by keywords is a pretty useful tool if you wanna see the advertisers in the particular market. In addition, it also helps you figure out how to design your ads! This section is really worth exploring as it shows you the best ads according to your filters: country, creative type, ad network, and period of time. This allows you to check current industry trends and design the right ads. Note: if you wanna check adult ads, don’t forget updating your preferences so as to allow adult ads! Long story short, WhatRunsWhere is a wicked service for affiliate marketing beginners. That being said, you should understand that true pros will always want a platform with more advanced tools. As we’ve mentioned above, there are many quality spying services available on the market. We wanted to help make this choice easier for you. 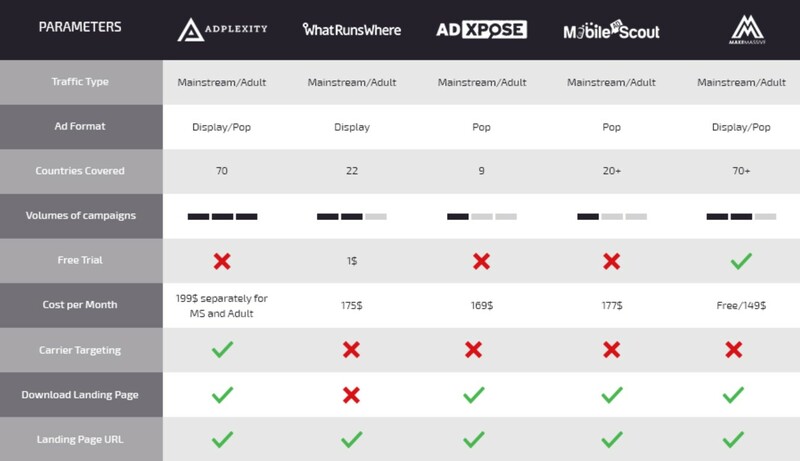 That we’ve made a super cool, mega detailed comparison table! Check it out and take your pick of the best spying tool around! 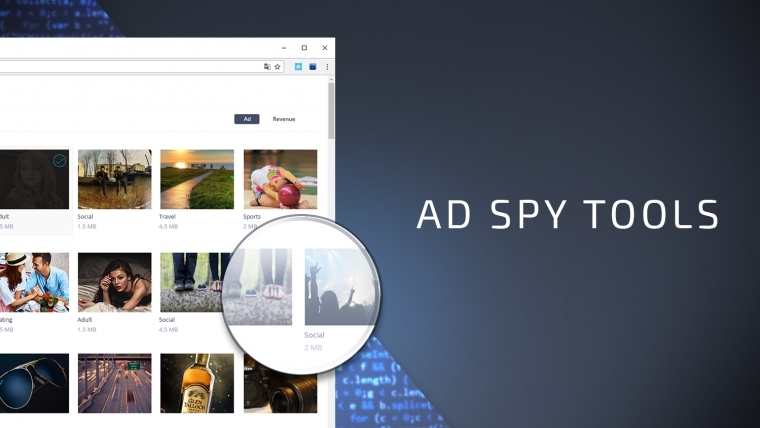 We truly recommend to use an ad spy tool but we’ve also gotta mention that you may not even need a tool to monitor your media buying enemies. For instance, let’s say you’re wondering what and how other affiliates promote on a particular website for the mobile Wi-Fi traffic of some country. You can use a VPN service along with the User-Agent Switcher extension for your browser! Just connect through a VPN to the country you’re interested in. Then make it seem like you’re using a mobile device on the User-Agent Switcher extension, and check the website. In case you don’t know the website you wanna check, just launch the campaign on the ad network, spend 50 miserable cents, and you’ll get the long list of websites on your stats. Additionally, never hesitate to ask your account manager for suggestions on how to promote a particular offer in a particular segment! Trust us: it’s probable that they know a bit more than you. Keep spying like crazy and become the example of success in affiliate marketing!